This past week I took over the Elliott Fouts Gallery Instagram (@efgallery) as their featured artist for the month of July, 2015. 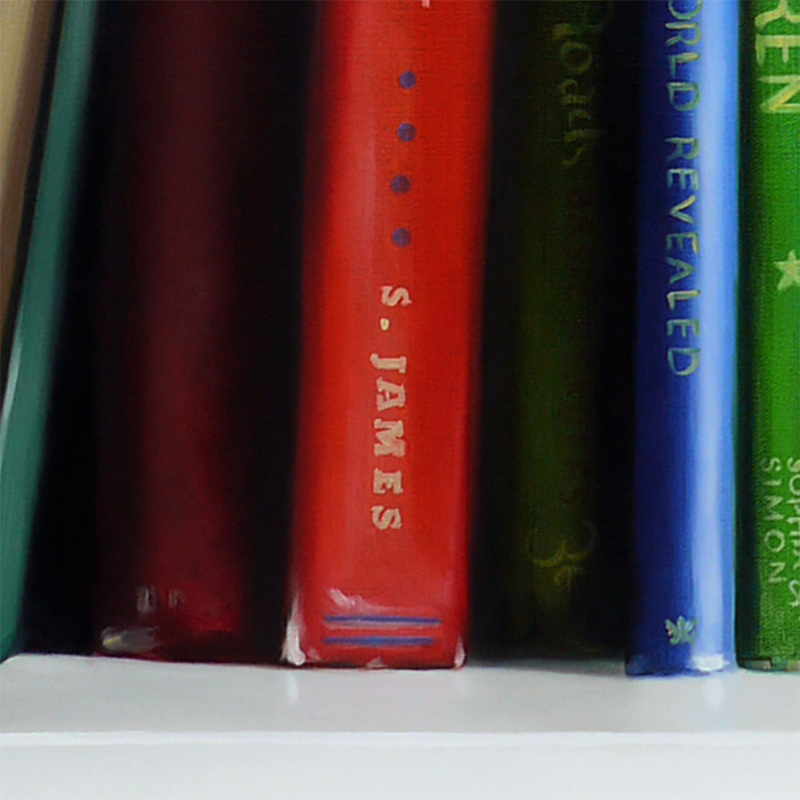 The first time I started painting books, they were simply used as props. I had very traditional still life subjects (fruit and the like). 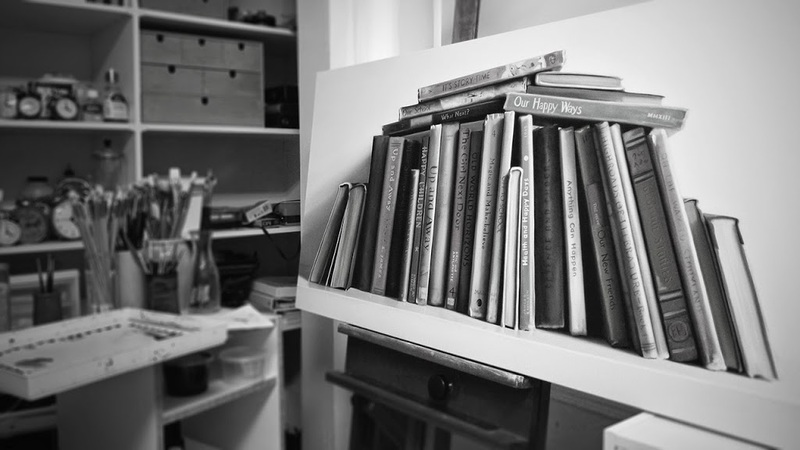 Books were simply there to add some new dimension to the paintings. I first started by using my own hard cover books with the sleeves taken off. 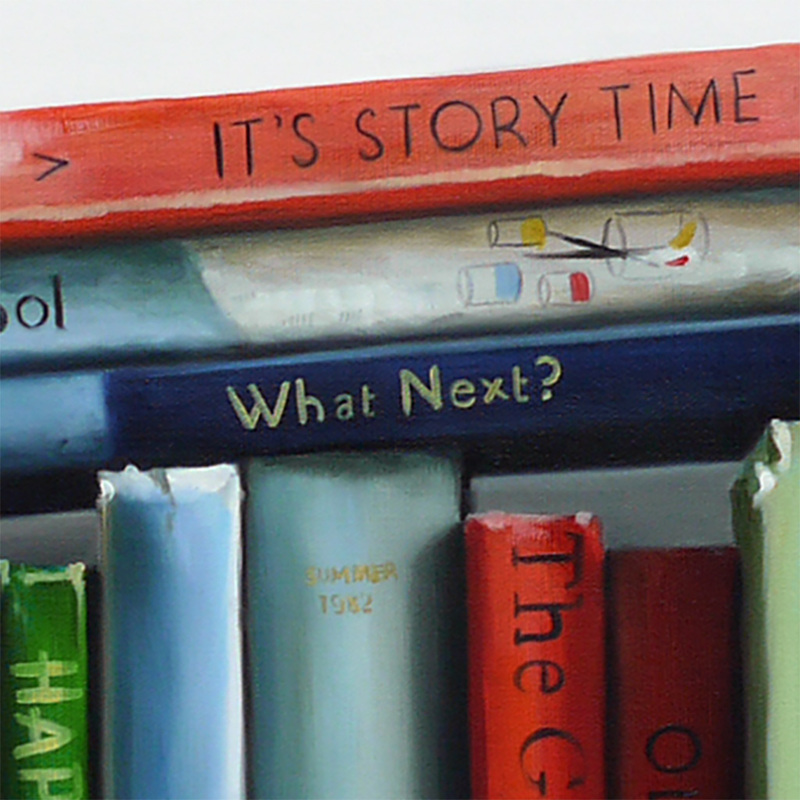 You can see some of my early book paintings here, here, and here. My own library of books had no character. They were clean, crisp and new. My mother-in-law has an amazing collection of books in her library. 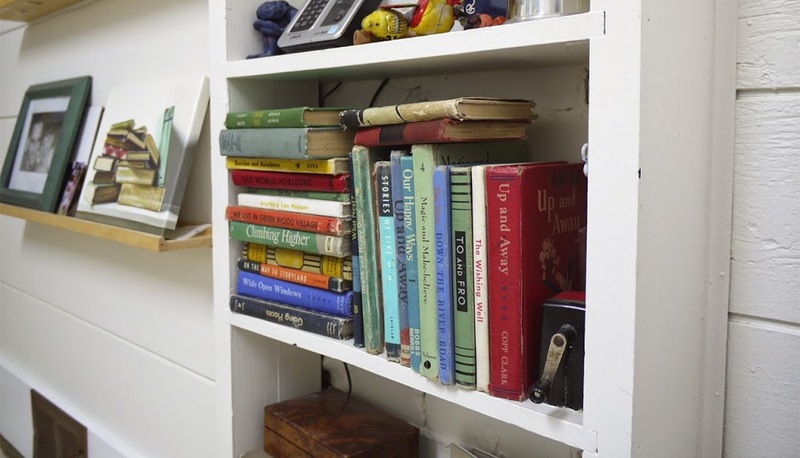 I borrowed some of her antique books and started using them — check the early ones out here, here and here. Then it dawned on me. Some of the books from my MIL’s collection had these fantastic titles. The books once belonged to a young law student who was studying in 1905. These ethics and philosophy books took my work in an all new direction. The books were not just props. They were the context, the narrative, the reason to paint. I made my way to one of the antique shops I frequent and stumbled upon a children’s primary reader It’s Story Time. Felt like magic. I was able to juxtapose the book with the lofty legal tomes. An interesting dichotomy. You wait for something like this to come your way when you paint for years. Something that you know is yours, and becomes direction that you can follow for years. The first four paintings using It’s Story Time were with my MILs antique legal books. Then I began collecting children’s primary readers. I’d pop in to antique and vintage shops and pick up the odd primary school book. Slowly adding to my collection. Using them to tell the stories in my paintings. Using the books to add colour, ideas, structure to my work. Authenticity is something people can feel and understand in an artists work. The few times I’ve been asked to invent or fudge book titles, it felt wrong. It’s not what I want to do as an artist. Having the actual books makes the work authentic. I’ve done many book paintings and I’ll continue. They really do feel like my own unique offering to the vast world of painting and art. 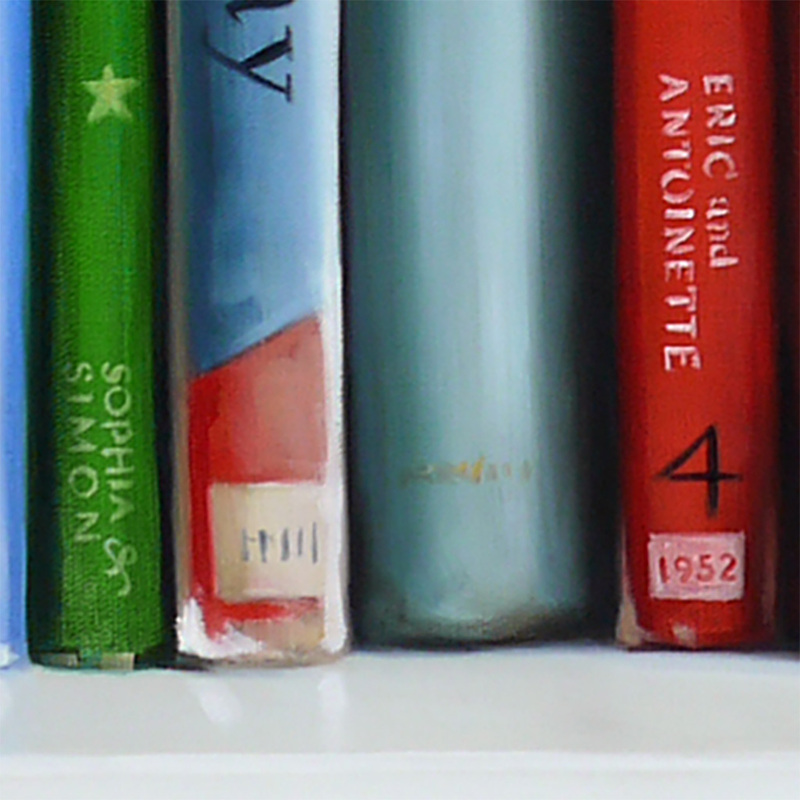 I put details in to the books that make the paintings more autobiographical. My children’s names in place of publishers imprints, anniversary dates, all these bring your work to a different level. In a way, these details breath life in to painting. 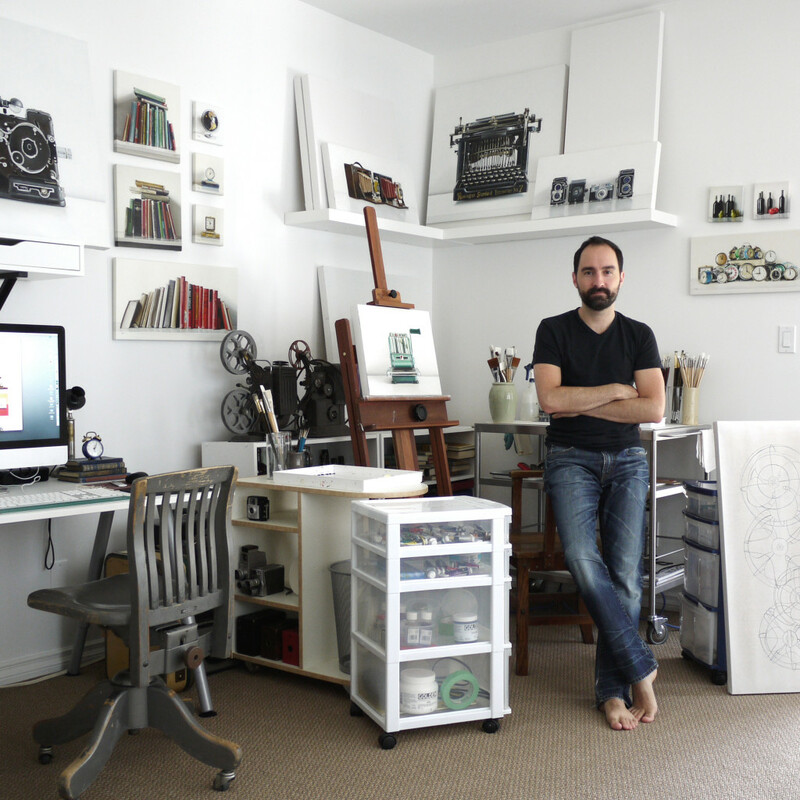 When I’m standing with someone looking at the actual painting in my studio or in a gallery, they see my work is far more painterly and looser than they first thought. American Art Collector June 2013. It’s nice when your efforts get recognised in print. 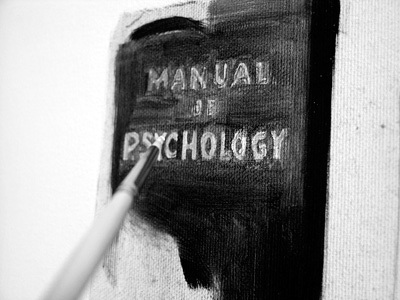 Today I began a painting with a book, the “Manual of Psychology” as one of the subjects. By an author who’s last name is so similar to mine that I was thinking I could be very sly and sneak mine in instead, we’re just one letter off. But I won’t because I claim no authority on the subject of psychology. I’m fortunate to have an antique shop a block from my house. However, I’m a little worried about how long it’ll continue business, as the fellow who runs the place looks like he’s been at it for about, oh, 150 years. When you enter the shop you have to courteously announce your presence because I’m not so sure he can actually turn to see if someone has entered. If I were a portrait painter I’d try with all my might to capture this fellow. I recently read The Lathe of Heaven in which a tortoise-like alien owns and operates an antique shop… well, lets just say that entering the shop near my house leaves you wondering if you’re trapped in a science fiction novel and your dreams are coming true. 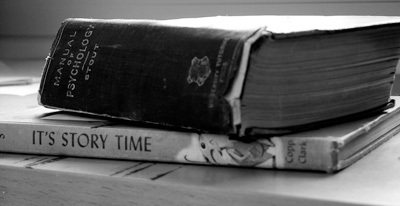 I picked up the book “It’s Story Time” at the aforementioned shop. I think its title and subject contrasts perfectly with the thick, heavy subject and title of the “Manual of Psychology”. I’ll put that down in the notebook with ideas for future paintings.